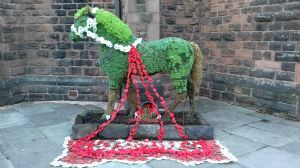 A church in Woolton commemorated the centenary of the end of WW1 by featuring poppy installations, a huge plant horse, and inviting the community to tie red or white ribbons to the church railings. St James’ Methodist and United Reformed Church, on Church Road South, wanted to hold a Season of Remembrance, and challenged the congregation to produce 1918 poppies, in whatever material they chose, for an installation. The Season of Remembrance opened for a month on 10 November. The horse "Jimmy", a full size wire framed horse with succulent plants, was displayed with white poppies, to commemorate all the horses who were taken to war. Over 500 children – and many other members of the public – found out about war at Christ Church URC Haydock’s Remembrance event. 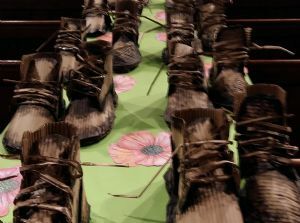 Church member Jane Burgess explained, “The church was decorated by five local schools and was open to the public and schools for a week after Remembrance weekend. It was amazing and many, many local people came through our doors to remember and share. Over 500 schoolchildren came to learn about the war as well. Our teenagers ran the cafe. Some of the children wrote poems.